Military is closely related to Discipline. Discipline is one of the key features of Military schools and colleges. To serve the nation is considered to be one of the most essential parts of Military training. The most important aspect of this training is to motivate students to serve the nation in best possible ways. Thus, it develops the feelings of love towards nation. These schools emphasize on teaching moral values including self-discipline, self worth, confidence, sacrifice and many more. It provides education which is not only unique but possibly the best of all. Military schools are available at every level including military preparatory, two-year College; and university that is a four-year program. Military education leads to good career opportunities and at the same time provides unique challenges to generation of today. In short we can say, these schools are quality oriented institutes which use a proven teaching method; the method that emphasizes on developing leadership skills, academic excellence and strong values that help students to lead a life of service and excellence. You may enroll in a preparatory, boarding or a military academy; that will help you to become one of the finest and successful citizens. The reason behind, is that each of them offers a unique learning environment based on the age and experience of a particular student. Military colleges focus on all exercises related to character building including being a team member or a leader; learn to execute orders, sacrificing personal desires for the good of entire team; and many more. Secondary military schools are for the students who require attention and direction. These institutions often bring positive changes in their lives. Many such schools develop the sense of responsibility and self-esteem. Structure and behavioral model is introduced to Students, which they may not get in other educational environments. Post secondary military schools prepare students to find jobs in defense. These schools are right choice for the ones who prefer career in armed forces. Such colleges are also available for navy, army, air force and marines, depending upon which wing of service you will prefer. 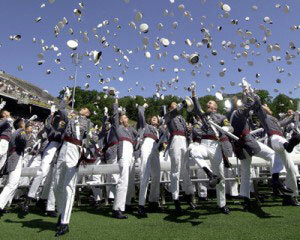 There are numerous career options available for graduates from postsecondary military schools. They can work for the government as well. One may join the armed force as officer having completed bachelor's or graduate degree. People like to serve in Defense Forces for a variety of reasons. Some take military as a service towards nation while other may like it due to the numerous benefits it offers. To some people, armed services develop the values that lead to character building. The military college prepares students for a variety of occupations. In addition to the salary, one gets various facilities for entertainment and at the same time allowances for healthcare while serving in defense force. Military schools contribute greatly in lifelong development of each graduate and often lead them to the career path towards service academies.